With your support, the Summerset Festival is able to bring our community (businesses, families, non-profits, neighbors) together and celebrate our community neighbors and businesses while raising money for our South Jeffco parks and recreational areas. The proceeds raised from Summerset Festival help to fund Clement Park and other FPRD area improvements including adding trees, playground equipment, health equipment, etc. 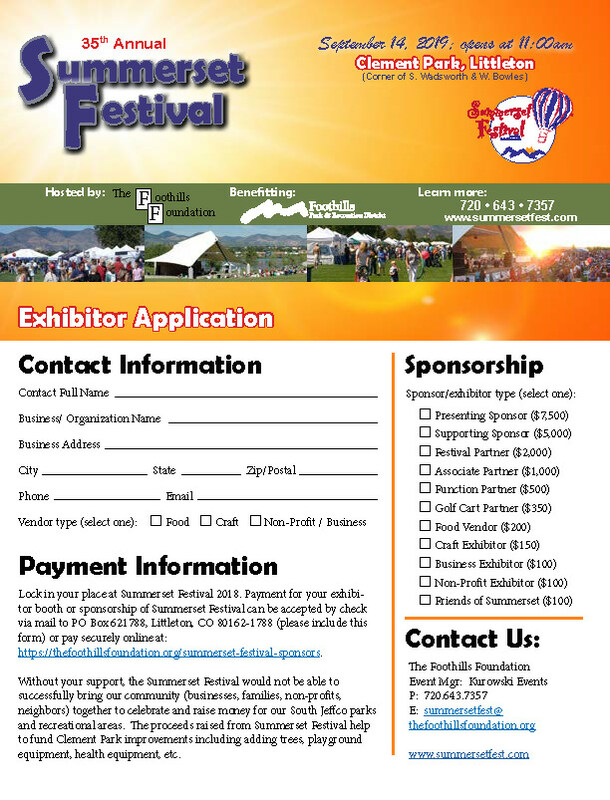 Why Should You Sponsor Summerset Festival? Please select your sponsorship level or exhibitor booth preference below. You will be redirected to our Foothills Foundation website to complete your secure online registration and payment. One of our Summerset Festival coordinators will connect with you shortly after you complete your registration. Please download the Exhibitor Application if you’d like to submit your registration via mail.